Located in northeastern Spain, very close to the border with France, the Bay of Roses offers some of the most exciting yet safe conditions that have long made it very popular and a choice destination for all those who enjoy nautical sports. 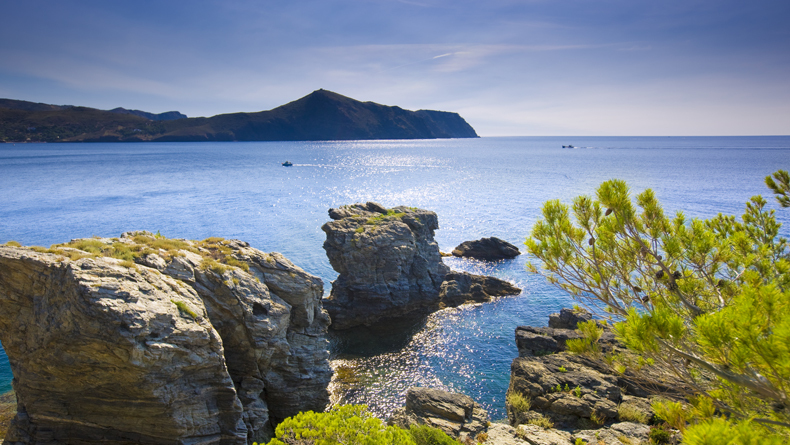 The Costa Brava, the Wild Coast, stretches from about 30 miles north of Barcelona along the entire province of Girona and features plenty of beautiful sceneries nearly everywhere. But its northernmost part, the one touching on the Bay of Roses, is the one that truly lives up to the name, combining secluded coves with sandy beaches and the rugged Cap de Creus peninsula into a succession of overwhelming sights. Particularly if they are viewed from the water. The Bay of Roses opens to the east and has a diameter of 9 miles. It lies in the path of some of the most constant winds in all of Spain. The strong and steady Tramuntana blows from the north – offshore – and maintains a firm grip on weather conditions in a region that extends from the Pyrenees down to the Mediterranean. It is particularly strong in late autumn and winter, when it can get up to force eight or nine – even for several consecutive days! The thermal winds prevail during the summer months, from June through September, blowing south, southeasterly, and averaging between a mellow force three and lively force five. The summer thermal wind is reliable and builds up towards midday.